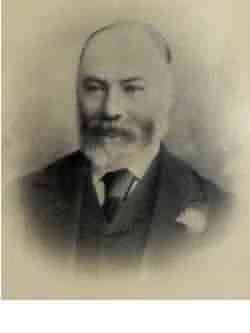 Edwin Helliar was born in South Petherton in the very early part of 1834, the son of William Helliar. His mother is unknown and it is possible that both his parents died when he was young. By the time he was eight he was boarding at Whitehall School in South Petherton with his nine-year old brother James and ten years later he was living with his uncle John Jeffery, a farmer at Puckington, Somerset. By 1861 Edwin was living in Yeovil and working as an assistant to chemist John Alexander of Hendford, in the run of buildings opposite the Three Choughs. In fact Edwin appears to have had two distinct careers; as a chemist and as a seed merchant. He had been working as a 'Manufacturing Chemist' in his own right since 1857 when, at the age of 23 he developed "Helliar's Celebrated Fly, Tick and Lear Powder" for dressing sheep and lambs as an alternative to dipping. He advertised his product in the local press for many years (see Gallery). On 19 November 1864, at Chilcombe, Dorset, Edwin married Elizabeth Cousins (1834-1916). They were to have three children; Alice M (b1866), Edwin Marsh (b1867) and Elsie May (1876-1941). The Post Office Directory of 1866 noted that Edwin Helliar was a 'Chemist of Town's End' which is, presumably, where he and Elizabeth had their home at this time. The Western Gazette's edition of 10 April 1868 noted that Edwin "of London Road" (today's Sherborne Road) had been appointed as an agent for fire and life insurances for the London Assurance Corporation (see Gallery). In 1865 Edwin joined the Lodge of Brotherly Love of Freemasonry in Yeovil although there is no record of him becoming Master of the Lodge. I couldn't find the family in the 1871 census but the Post Office Directory of 1872 recorded Edwin as a 'Chemist and Seedsman of Middle Street'. From his advertising of the period he was located at 66 Middle Street - although due to renumbering this is not the 66 Middle Street of today. The Post Office Directory of 1875 recorded him as a 'Seedsman & Manufacturing Chemist'. It was during the 1870s that Edwin became involved in local politics and he was elected to serve on the Town Council in November 1874. In the 1881 census Edwin, Elizabeth, their three children, Elizabeth's mother Susan Cousins and a servant were listed living in Kingston. 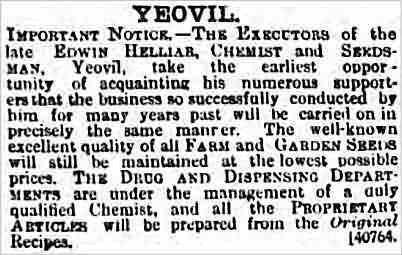 Edwin gave his occupation as 'Chemist & Councillor of Borough of Yeovil'. 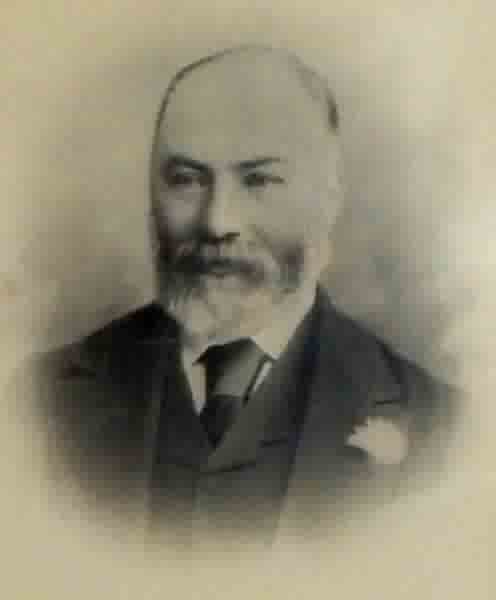 He was to serve as Mayor of Yeovil from 1884 until 1886 and retired from the Council in November 1889. In 1888 he was made a Borough Magistrate. He was also a long time member of the Yeovil Agricultural Society and a member of its Committee as well as supporting the Yeovil and County Poultry Show. He also served on the board of the Yeovil & Sherborne Building Society from 1877 until his death. Edwin Helliar died on Monday 21 May 1894 at his home in Yeovil. He was 62 years of age. Elizabeth died in 1916 aged 82. Edwin's business was carried on by his son Edwin Marsh Helliar until his death in 1921 but the business of 'E Helliar, Seedsman of 66 Middle Street' was still listed in Edwin Snell's Directory of 1954. 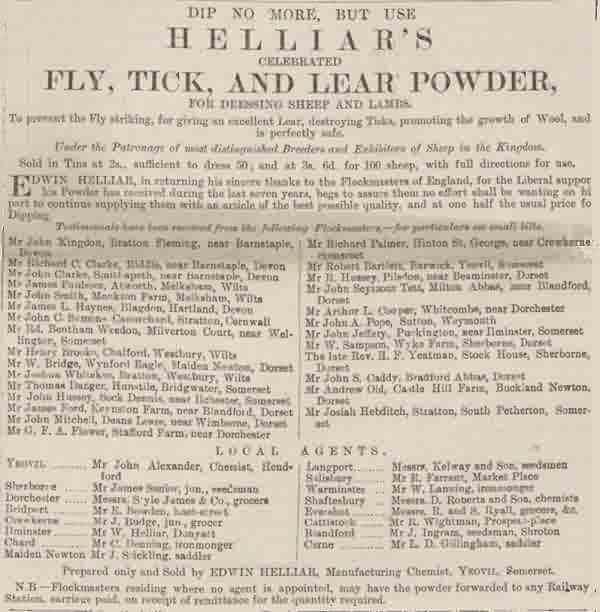 Edwin Helliar's advertisement placed in the 2 August 1864 edition (as well as many others) of the Western Flying Post, advertising his 'Fly, Tick & Lear Powder'. Note that he states that his powder has been "received during the past seven years" indicating that he developed it in 1857 when he was 23 years old. Note too that the first of his 'local agents' was his employer John Alexander. The Western Gazette's edition of 10 April 1868 noted that Edwin had been appointed as an agent for fire and life insurances for the London Assurance Corporation. 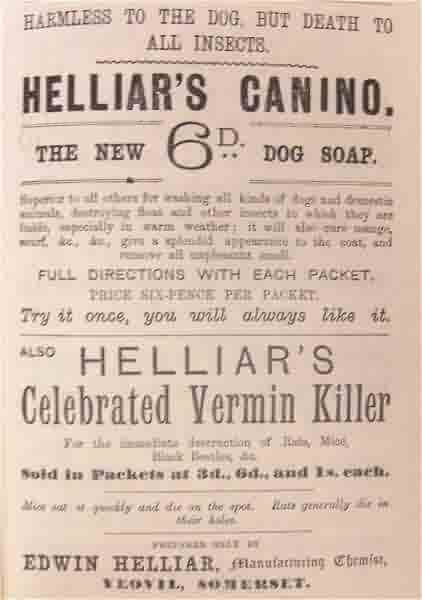 Edwin Helliar's advertisement in Whitby's Yeovil Almanack Advertiser of 1881. This advertt was run annually in Whitby's for nearly twenty years. 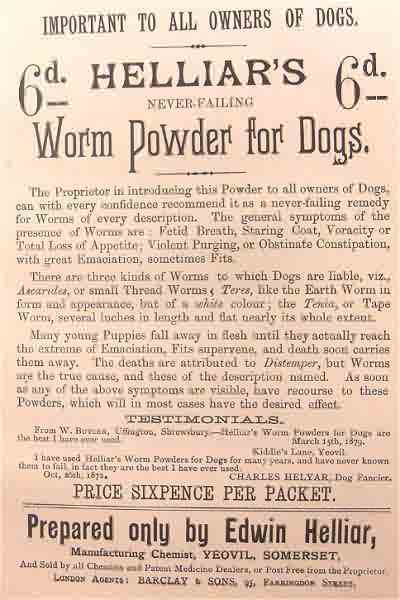 One of Edwin's advertisements for a later product - Worm Powder for Dogs - this is from Whitby's Yeovil Almanack Advertiser of 1889. Edwin Helliar's obituary from the 30 May 1894 edition of the Taunton Courier. Notice of continuation of Edwin Helliar's business from the 15 June 1894 edition of the Western Chronicle.